Water covers more than half of the earth! We swim and play in water and we even dance in the rain. Water is a liquid and this week we will learn about water and different liquids that we encounter all the time. 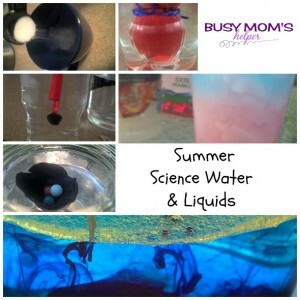 Summer Science Water and Liquids we will explore how a boat floats, command a sea diver, and even make a refreshing drink! Water is needed for us to survive and also to help us grow plants. Water is a liquid which is a substance that flows easily. There are other liquids such as oil that we use in cooking. Liquids can also become solids, like ice, when we freeze water we are changing it from a liquid to a solid. Heating the water up causes it to evaporate or turn into a gas which is called ‘water vapor,’ which disappears into the air. This water vapor will cool and when it does it turns back into water, a liquid. Everyone needs water, even animals and plants need water to live. Water help us keep our bodies working. Water is very strong and can change the shape of land. Waves from the sea hit the shore and will wear the rocks away. Rain washes dirt into rivers which carry the dirt from place to place. A Snowman is made with solid water which we call snow. Snow is made up of frozen water crystals. Ever see a ship and wonder why it doesn’t sink? Weight does not matter whether an object will sink or float it matters how much water it “displaces” or pushes aside. Boats have safety levels on the sides of them which helps show a safe load level for that boat. Drop marbles and a ball of clay into the water and notice how they all sunk, which means it did not displace much water. Take the marbles and clay out and shape the clay into a boat shape. Place the clay into the water and watch it float, more water was displaced and pushes with more force so it can support the clay boat causing it to float. Carefully place some cargo, or marbles, into the boat. The boat lowers but can still float. Command your own dive. The concept of this pen diver demonstrates how submarines and other vessels work that dive deep under the sea. If there is a hole in the tip of the pen seal it with modeling clay. Roll a small piece of clay into a ball and stick on the pen clip. Put your diver into the glass of water, add or remove clay so it floats. The tip of the pen should be above the water. Fill the bottle to the top with water and place the diver in and put the lid back on. A bubble of air is trapped inside the top of the pen and causes it to float. Squeeze the sides of the bottle and watch the diver dives down to the bottom. Water enters the top of the pen and pushes the air out so the pen now sinks. Release the bottle and see the diver return to the surface. Water left the top of the pen and the air in the top of the pen causes it to rise back to the top. Hot water rises to the surface and floats on cold water. So when an Underwater Volcano erupts the hot water will rise to the surface. Cut two pieces of string and tie around the narrow-necked bottle so you can easily lift it into the large glass. Fill the large glass jar with cold water until it’s about ¾ the way full. Fill the small bottle with hot water and dye it red. Hold the small bottle by the string and gently lowers into the jar of cold water. The hot red water rises from the bottle like smoke like a volcano. Even though there are different liquids not all liquids will mix together. See how oil and water will separate from another and how some liquids like oil won’t dye another color. I had way too much fun with this one and I know that sounds stupid but I tried different colors, mixing it differently, and even multiple colors so a lot of fun with a simple experiment. Pour some water into the glass container. Dye it another color like blue or green. Pour oil into the container of water. Have the kids try to mix it together and let them watch it separate again. Let the oil and water separate. Drop a couple drops of food coloring into the oil. It will rest at the bottom of the oil. Now with a fork push the food coloring down into the water and watch the water change colors. Substances like water are made up of very tiny particles called molecules. When sugar dissolves in water, the sugar molecules get into tiny holes between the water molecules. Because of these little gaps we can add sugar to an already full cup of water. Fill a cup with warm water all the way to the top so it’s almost over flowing. Now pour a teaspoon of sugar on top. The sugar will dissolve into the water but not over flow the cup. Add in more teaspoons of sugar waiting a little bit between each one and the cup will not over flow. See how many teaspoons you can get in before it overflows. Now we know oil and water doesn’t mix, what about other liquids? These liquids will mix together but we can layer them. Because these drinks of different amounts of sugar the ones with lighter amounts of sugar in them will sit on top of heavier sugar content ones until stirred. Since 4th of July is coming up we will do red, white, and blue. You can do these drinks with other colors/flavors just check the sugar content, the heaviest sugar content drink will go on bottom. Fill your cup about 1/3 of the way with CranApple juice. Finish by slowly pouring in the blue Gatorade. This amazing & creamy Strawberry Julius recipe was originally shared in May 2013. I’m resharing because it’s not only delicious and easy to make, but the perfect summertime drink recipe! In the mall where I grew up there was an Orange Julius. It isn’t there now, but I remember that whenever we’d go there and hang out during high school (there wasn’t much else to do in Cache Valley, so wondering the mall was the ‘cool’ thing) we would stop by and get one. My favorite was the Strawberry Julius. Not a huge fan of orange, but strawberries are WONDERFUL! So this drink was just so refreshing, flavorful and creamy. I’ve been craving one for awhile, since we went on a LONG drive to Disneyland in March. One of the places we stopped for lunch had an Orange Julius place there, and it was a great trip down memory lane to get a Strawberry Julius. Then I decided that I should make it myself! If I’d realized how simple it was, I would’ve been making them for quite awhile! Mix all of the ingredients in the blender until smooth. Enjoy!!! Raise your hand if you love Dr Pepper® – even though you can’t see me, know that my arms would both be waving madly in the air right then. It’s no secret whatsoever that I have a mad love for this yummy beverage, and any excuse to use it in my celebrations! With college football upon us, I thought it’d be fun to share how you can throw an amazing home-gating party – with plenty of delish foods – with these 4 Amazing Dr Pepper® Recipes for Game Day! 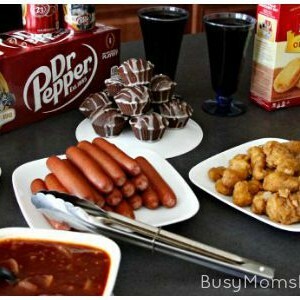 Now, to save us all from a SUPER long post and having anyone get the ingredient lists messed up, here I’m showing you my complete Dr Pepper® themed football spread, along with one of the recipes. I’ll link up the other THREE fabulous recipes so you can hit them all and be the winner of the game – or at least of the game party! Don’t forget to hit up Kroger for all your Game Day Greats items and get plenty of Dr Pepper®! This Dr Pepper® Hot Dog Sauce is so finger-licking good, and you can find all SORTS of foods to put it on, not just some good ol’ hot dogs! It’s tangy, but not necessarily spicy. Scoop it over your dogs with some of your favorite toppings like pickles, and chow down while rooting for your favorite college team! In a medium saucepan, cook the onion and butter over medium heat until the onions are tender, about 6-8 minutes. Add the garlic and stir until fragrant, about 2 minutes. Add the remaining ingredients, stirring well. Reduce heat and simmer, covered, about 15 minutes. Uncover and continue simmering until the sauce starts to thicken, about 20-30 minutes. Remove from heat and cool a bit before enjoying over your game day hot dogs! To go along with your mouth-watering dogs, don’t forget these Spicy Dr Pepper® Chicken Strips (or wings, your choice). The flavor is amazing, and it’s another great lick-your-finger good game food! I also really enjoy some classic crackers such as Town House® crackers, Club® Crackers, and Cheez-It® crackers to dip in either the hot dog topping sauce (told you it was versatile!) or even in some leftover spicy chicken sauce! You can’t REALLY have a home-gating party without something sweet to finish things off – so why not these Dr Pepper® Donut Muffins? I don’t know which is better, the muffins themselves or the Dr Pepper® Glaze on top. Together, it’s a winning team! Plus, super easy to make – more time to watch your team! Finish everything off either with an always-amazing, one of a kind Dr Pepper® drink – or try something NEW like this CREAMY Dr Pepper® Mocktail! Now you’ve got a WINNING spread of game-worthy foods to turn the biggest football fans, into YOUR biggest fans! Don’t forget to check out your local Kroger for an in-store sweepstakes with Miller Coors®/Kellogg’s®/Dr Pepper® for fly away trips to Rivalry Games. See store for details. Which Dr Pepper® recipe are YOU most eager to try? 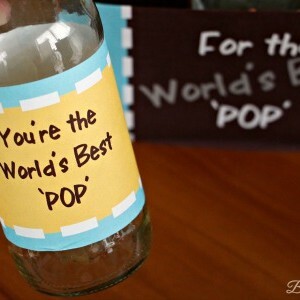 Father’s Day is fast approaching – like everything else, it seems – so grab these super fun World’s Best ‘POP’ Father’s Day Soda Bottle Printables for a creative gift this year! And guess what? There’s also a matching coupon book especially for Dad’s special day! I still can’t believe it’s almost summer, and all the events that creep up during this time of year! Since printables are so fun, and can be finished at the last minute (if necessary), I really enjoy browsing for some great ones – and sometimes make my own! I also shared the awesome Father’s Day Coupon Book printables over on Thirty Handmade Days, so be sure to go grab those and say ‘hi’ to Mique while you’re there! Cut out each of the pieces, then attach them to the corresponding part of the soda bottle and carrier. I have the easiest time using double-sided tape, but you can work with glue or regular tape if you’d prefer. I tried to make it fun, with colors that the typical dad would enjoy. There’s plenty of different soda options to choose from – this one is an empty orange we had already. Gift either the full sodas, or do like we did and fill it with his favorite treats! Dad will love the treat, and the coupons that come in the printable book are PERFECT for some much-deserved daddy relaxing and fun! What are YOUR dad’s favorite treats or drinks? Also check out our Graduation Soda Bottle Printable Set! Can I get all my pumpkin-lovers to raise their hands? It’s a HUGE thing at our house, almost as big as chocolate! I love how flexible it is with all our baking, being able to do all sorts of yummy recipes with it. 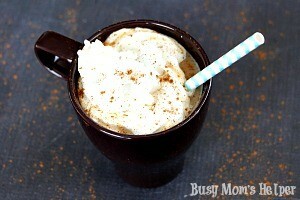 Hubby recently created one of his new favorite drinks using it: this Pumpkin Spice Chai Latte! This drink has been great, especially with how cold it’s been here in Texas! I know our temperature is nothing compared to many, but for us it’s really dang cold. Having a nice cup of hot cocoa or this amazing Pumpkin latte is just the ticket…that, and a fuzzy, snuggly blanket to curl up in! If you’re wondering about the ‘chai’ in the ingredients…you can buy a little container in the tea aisle of liquid chai drink! We found it at Costco and Walmart, so I’m sure it’s most other places, also. For the canned pumpkin, be sure to use plain pumpkin and NOT pumpkin pie….if you do choose to use that, just remember it will be sweeter so you may need to adjust your other ingredients accordingly! I think it’s totally fine NOT warmed up, too….but it’s cold outside, so get some heat into your body, pull some fuzzy slippers on your feet and cozy up in a soft blanket. Insert a special someone to snuggle with and you’ve got a WINNER of an afternoon! As it gets colder, there’s really nothing like some delicious hot cocoa while snuggled in a fuzzy blanket! You can do these simple DIY Cocoa Melts wrapped up as a gift, so others can enjoy a creamy cup when they want, or keep some for yourself on those chilly evenings! 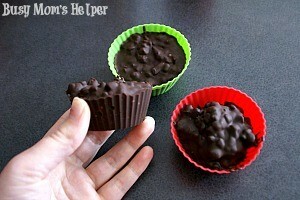 I got the idea for these Cocoa Melts when I was making our Chocolate Rimmed Party Glasses for Christmas Eve this week. What should I do with all the leftover melted chocolate and delicious toppings? Then it hit me….mix them all up so that we could enjoy them as totally flavorful hot chocolate later! Melt the chocolate completely. I do this by putting it in a microwave-safe bowl and heating on 50% power for 30 second intervals, stirring well between, until it’s melted. Stir in some of the peppermint pieces and marshmallows. It’s up to you how much to use! Scoop into the cupcake liners and fill about 3/4 the way full. Stick in the fridge or freezer so the chocolate hardens. Then you can just pop them out and either wrap them up as a gift, or place in a zipper baggie for you to enjoy later! Note: if you like it more rich and chocolaty, just do 2 cups of milk. You can always mix more milk in after to cool it down, too! Get creative and try other mix-ins, if you want! How did y’all like Halloween? As crazy as October was, I’m amazed that it’s already over! Welcome to November….the start of the two craziest months of the year, it seems! I think today we should all recover from the week’s craziness first, though, and enjoy a special treat! My kiddos are stocked up on candy, munching happily through their stash. 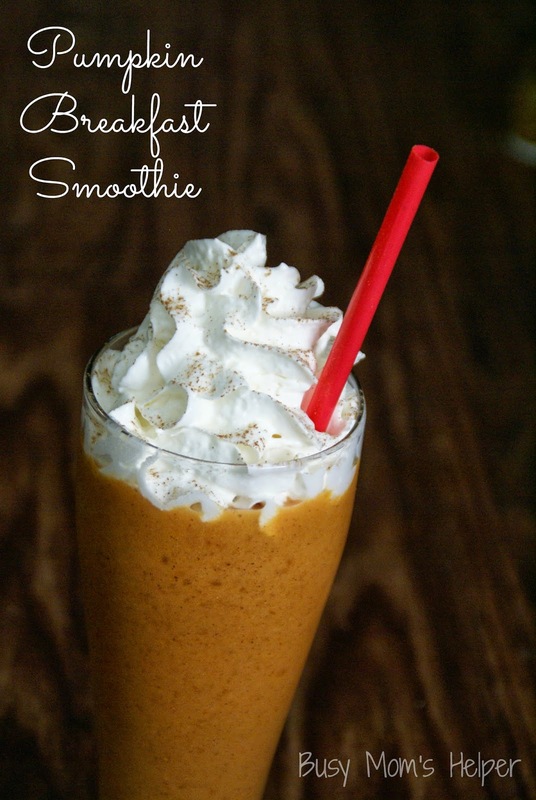 Hubby and I do love a good candy bar treat (and may nab some here and there without the kids knowing), but often we’d rather something a bit better, such as this Pumpkin Spice Milkshake! Even though it’s cooling down a ton during the nights here, the afternoons are still way hot and bright. 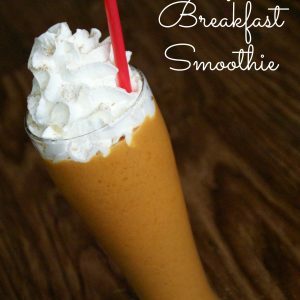 This refreshing, creamy pumpkin spice milkshake has the perfect blend of flavors, making it smooth-yet-flavorful. I love it, although I’m not sure who loved it more…me or Hubby. Guess we can just use two straws and share, right?! Nah, I’ll just whip up two of this quick recipe! In a blender, mix everything except the ice cream and whipped topping. Once mixed, add the ice cream and blend until you reach your desired consistency. More ice cream = thicker milkshake. 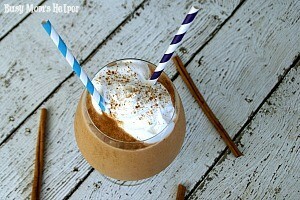 Pour into a tall glass and top with whipped cream and a sprinkle of pumpkin pie spice. Enjoy! You know how kids will change their favorite things so often, it’s sometimes hard to keep up? My 4-year-old Superman is NOT like that! Most of all is his favorite color: ORANGE. He’s so obsessed with the color that he insists he always gets it….the orange plate, the orange cup, the orange candies, and on and on. Can you image what his favorite soda is? Yup, Fanta Orange Soda! So with Halloween right around the corner, it’s the perfect time to embrace all things orange….including this delicious Two Ingredient Fanta Cake! You heard that right…TWO INGREDIENTS! Can’t get much easier than that, right? So we can have our Orange Soda, Orange cake, and then just toss in a few other items (there IS such a thing as too much orange!) like these adorable Dasani Bats! Don’t worry, I’ve included a free printable for those below, too. You’re welcome! Since our soda stash had run dry (I know, sinful, right?) Green Lantern and I swung by Walmart while the twins were at preschool. Although I could probably find the soda aisle blindfolded, it’s super easy to find with their well-marked signs. I even found some fabulous coupons on some of the packs – Woot Woot! Even though he isn’t totally obsessed with orange like his brother, Green Lantern was still SUPER excited to restock our pantry – he almost didn’t let go of the 2-liter! I don’t know what was more fun…making the cake, or seeing their couldn’t-grin-any-bigger faces covered in this fun Halloween snack! Another great thing about this recipe? When you pour in the soda, it all becomes a ‘bubbly brew’ and the kids think it’s the neatest thing ever! Even I think it’s fun…I mean, look at all those bubbles…. Preheat the oven according to cake mix box directions. Spray a 9×13 pan (or multiple smaller pans), set aside. Dump the cake mixes into a LARGE bowl (remember, it bubbles up!) Pour in the soda and mix well. Spread into a sprayed 9×13 cake pan (or multiple smaller pans). Bake according to package directions. Allow to cool completely. 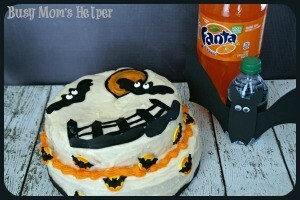 When your cake has cooled, decorate it all festive for a fun Halloween snack! Let the kiddos help, or just take over the creativity by yourself. Notice ours has plenty of orange….ya, it’s definitely a good month for Superman’s color obsession! I love how moist this cake turns out…plus it’s full of yummy Fanta flavor inside! I paired it with a cream cheese frosting….and even added a bit of Fanta soda into that to spread more of the great taste. If it makes it runnier than you’d like, a bit of powdered sugar mixed in will thicken it right up. Don’t worry, I haven’t forgotten about the cute Dasani Bats! Since you never know when you’ll need it, we like to keep bottled water on-hand to just ‘grab and go’. Especially the smaller 12 oz. size…it’s perfect for my kiddos! Whether it’s racing out the door to dance lessons, heading to the park or even just as an emergency back-up in our vehicles, these mini bottles have saved us on more than one occasion! I also love that they’re specially designed to stand upright easily….not falling all over the shelves in the fridge! Now, imagine passing out these fun bats this Halloween! We made plenty to hand out, so our trick-or-treaters can have a quick drink in the middle of their walking. All you have to do is Print This Page for the shapes, then put it together in a snap! Wrap a piece of black paper around the Dasani bottle and tape into place. Cut out the shapes onto black paper, and tape onto the center of the bottle. Glue on googly eyes and you’re done! Want to join in the fun with Fanta and Dasani? Head over and follow them on their social channels! If you’re up for extra fun, there will be an in-store demo at select Walmart locations October 24-26th featuring Fanta, as well as Wheat Thins and Halloween Oreos. Free sample Halloween snacks…why not, right? We’ve been having a blast this Halloween season, and hope you and your family are, too! Even if your favorite color isn’t orange like Superman, it’s still super fun getting into the festive spirit. Happy Halloween! *I received free product to sample for this post. All opinions are my own. See my Disclosure Policy for more information. I’m a big fan of smoothies, especially for breakfast. It’s such a great way to add some fruits and veggies into my diet, plus plenty of healthy additives like nuts and protein powder. One problem? I’m actually picky with the flavor…it has to be delicious and a smooth combo of flavors, not just a mangled, weird-aftertaste type drink. Thanks to Goodbelly+ juices, I now found a great way to incorporate healthy juice and fresh flavors! My favorite recipe is this Strawberry Blueberry Juice Smoothie. One of the perks to these Goodbelly+ Shots is that they’re full of vitamins and calcium, plus plenty of probiotics, yet they taste great. I got some packs of their Blueberry Acia, and really love it! Some days I drink it straight with my normal breakfast for some added health benefits, but most of the time I mix it in with my beloved smoothies. And today I’m sharing my favorite combo so far: Strawberry Blueberry Juice Smoothie! Check out the adorable packaging, too! Who can resist a smiling little drink first thing in the morning? Or as an afternoon pick-me-up?! Super fun! 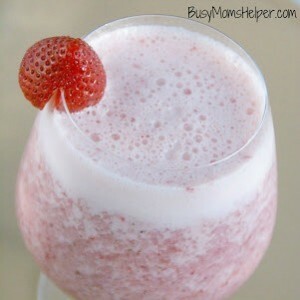 Put all of the ingredients EXCEPT strawberries in a blender and blend well. 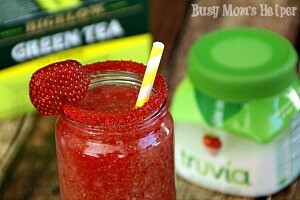 Add the strawberries and finish blending until smooth. One of the things I really love about this drink is that it isn’t TOO thick. It’s pretty much thin enough you can just drink it, but it’s definitely got a nice frothy chill to it! 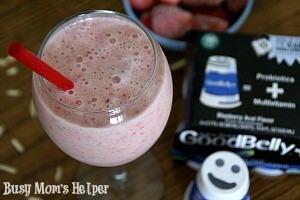 The Goodbelly+ makes it even healthier, so it’s a fabulous way to start the day of on the right note! Do you have some fun holiday traditions in your family? We have quite a few, but growing up one of them was having specific glasses we used during the holidays. They were clear and tall glasses with green and red polka dots. Simple, yet very cute! 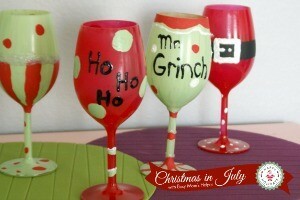 I wanted to make some special glasses for my own family, so we painted up these Design Your Own Christmas Glasses! They’re not the most perfect holiday glasses ever, and there’s plenty of smudges….but they’re fun, the kids got to participate, and they only cost $1 a piece! Yup, I’m all about the budget-friendly holidays here! Other than drying time, these Christmas Glasses are also really quick to make, and if you avoid the ones made of glass (or that are expensive), your kids can handle designing their own with limited supervision. Great family activity to get in the mood for the holidays! Notes: I chose these plastic glasses at Walmart, for $0.93 each. Paint your glasses their solid color on the outside of the glass. For the glasses shown, I did 2 red and 2 green. I do recommend stopping your paint line a tiny bit from the lip of the glass, so you don’t end up tasting the paint when you drink. I’ll be re-doing ours to avoid that! Allow to dry completely. Paint on your first accents. Stripes, dots, belt-line, swirls, etc. Have fun with it! Allow to dry completely. Do your second color of accents, puffy paint textures then text as you desire. There you have it….super-duper easy, very cost-effective, and totally festive! You could get really creative with the words, too…such as ‘Only Half a Drink More’ from the holiday song, ‘Santa I Can Explain…’ or get crazy with ‘Naughty’!